Hindi film lyricists use brand names in their songs in interesting but also ridiculous ways. Having seemingly run out of things to term a loved one, or simply to stand out, the new song from Laxman Utekar’s Luka Chuppi has the hero and heroine calling each other “Coca Cola”. The song, named after the soft drink, is a recreation of a hit Tony Kakkar single by composer Tanishk Bagchi. Young Desi’s rap has been retained while Neha Kakkar provides additional vocals. Luka Chhupi stars Kartik Aaryan and Kriti Sanon as a couple in a live-in relationship who suddenly have to accommodate their respective parents at their house, while faking a marriage. The film is set for a March 1 release. Lyricist and composer Piyush Mishra used the fizzy beverage’s brand name more creatively in Ranaji from Anurag Kashyap’s Gulaal (2009). 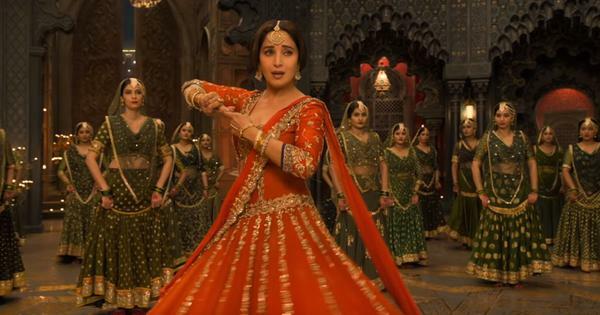 The item number is lipsynced to and performed by Madhuri (Mahi Gill) as a paean to her lover, the Rajput strongman Dukey Bana (Kay Kay Menon), whom she refers to as “ranaji”. The lyrics slyly draw parallels between Bana’s brute strength and that of the Western military-industrial complex. Here, the preference “ranaji” has developed for Western products such as Coca Cola is a dig at the anglicisation of Rajasthan and how the state has apparently detached itself from its traditional roots, which is a prominent theme in the film. How does one explain Munni Badnaam Hui from Dabanng (2009)? Malaika Arora lipsyncs to “Main Zandu Balm hui, darling tere liye”, referring to herself as a pain-relieving ointment and thus maintaining the tradition of Salman Khan film songs which embody a general contempt for the art lyric writing. Composer Lalit Pandit has written the song. Munni Badnaam Hui, Dabangg (2009). Salman Khan was also part of a 1990s film song that vigorously featured brand names. In the 1991 film Love, starring Khan and Revathi, the song We Are Made For Each Other has the lines “Colgate se phir humare daant cham chamayenge”, “Hum mahekte phirenge Old Spice ki mahek se” and “Nivea lagake hum kya lagenge socho sanam”. The video is shot like a series of advertisements, in which the hero and heroine frolic around standees and props depicting the products’ names. We Are Made For Each Other, Love (1991). A number of Hindi film songs in the 2000s and after, particularly in the Punjabi hip hop space, feature brand names. Badshah’s Abhi To Party Shuru Hui Hai from Khoobsurat (2014) has the rapper observing that the lady wears Jimmy Choo shoes. Another Badshah song, Saturday Saturday, from Humpty Sharma Ki Dulhania (2014) places the woman in an Audi car. Saturday Saturday, Humpty Sharma Ki Dulhania (2014). Seldom are brand names featuring in a song tied to the film’s story itself. One example is the title track of Anurag Basu’s Barfi! (2012). The deaf-mute hero, played by Ranbir Kapoor, is named after the defunct Murphy brand of radios. But he is called Barfi because he mispronounces his name. Written by Swanand Kirkire, the title track’s lines capture how the hero, as a child, grew up with a Murphy radio around him – “Barfi jab amma ji ki kok mein tha soya / amma ne Murphy ka radio mangaya”. Another more aggressive example of brand names tied to the song’s lyrical content as well as the film’s plot is Manhattan from Gauri Shinde’s English Vinglish (2012). The coy housewife Shashi (Sridevi) visits Manhattan for the first time in her life. The lyrics capture the top-drawer brand names that dazzle Shashi on the city’s streets. Again, it’s Kirkire on lyrical duties, who writes, “To your left is Prada, to your right is Zara, Giorgio Armani, Thank God it’s Friday / Gucci and Versace, Jimmy Choo, Givenchy, Diesel, Dior, Hokey Pokey, Gap and Bloomingdale.” These are only a few names in the song.